Roast your sweet potato chunks with a drizzle of oil and a sprinkle of salt, for 20 minutes at 180 Celsius. Make sure that they’re still a little firm, as this is just to give them a bit of flavour. Whilst they’re cooking, you can grate the carrots, onion and cheese. Once the sweet potatoes are done, mix them with the carrots, onions, cheese, and pesto in a bowl. You can add salt to taste, and add spices such as cumin or herbs such as parsley to give it even more of a flavour. Roll out the pastry into a square shape on a lightly floured surface. I used pre-made Jus-Rol, which was already this shape. Cut the dough into even quarters, so you have four little squares. 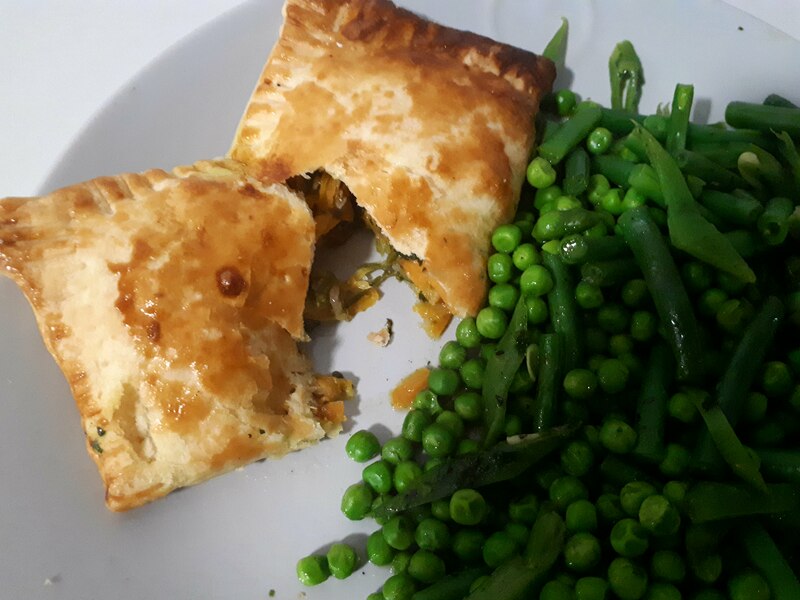 Fill half of a pastry quarter with the mixture, leaving room around the edges so you are able to fold it over and crimp down the edges. Make sure it’s nice and filled! Brush the egg wash around the edges of the pastry quarter. You can use a pastry brush for this, or if you don’t have one kitchen roll works as well. Then lift the top corners of it and fold it over the half with filling in it. Use your fingers to make sure the pastry fits securely around your filling, then press a fork down around the border to secure it. Press the fork down in the middle of the pasty as well to let out the steam. Brush the outside with egg wash, and place it on a lightly floured baking tray. Repeat for the other three pasties! Pop them in the oven at 180 degrees Celsius for 45 minutes, until they are golden and crispy on the outside. Voila! 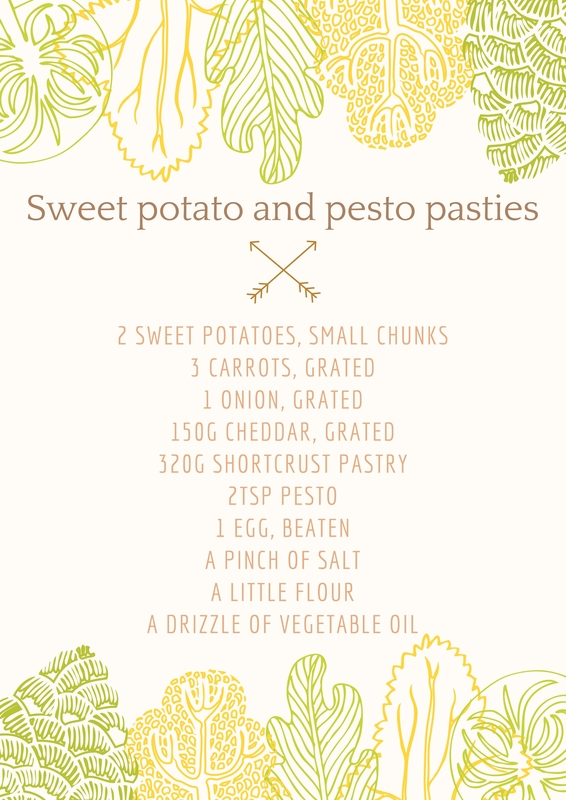 Your own sweet potato and pesto pasties, ready for you to gobble up. I served mine with a healthy dollop of vegetables, but mashed potatoes and gravy would also work a dream. If you have any leftover filling at the end, the mix also makes a tasty potato salad to have as a side dish the next day. Greggs can take a hike. (I didn’t mean that. I love you Greggs). Will you be giving this recipe a try? If you have any suggestions for food recipes, whether healthy or unhealthy, let me know!